This year we are discussing the Book of Martial Power (BOMP) on Saturdays. All principles are instantiated in some form in each technique. My instructors (and I after them) have often taught that aikido could be reduced to a minimal set of techniqes because any one or two techniques you can think of are examples of the entire system. 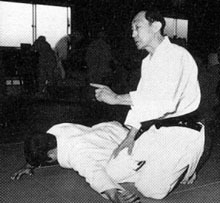 This is also my understanding of Tomiki's thrust in his system of teaching - that the thousands of possible techniques in aikido can be represented by 15 or 17-some-odd techniques. That these 17 or so techniques contained within them the majority of the vital content in aikido. Pearlman goes farther and states that any single aikido technique must be representative of the totality of the art. Of course, this is in the ideal. When applied by imperfect people against imperfect people, many of these principles will be expressed imperfectly or incompletely, or else disregarded completely. That's the art part of the martial art - striving to approach the ideal expression of the various principles. And that is one mark of a master - when an applied technique fails, the master understands which misapplied principles were at fault. So, if all martial principle is in evidence in every martial technique, why do we have more than one technique? Could it be said that Ueshiba only had one technique - aiki? Did Kano have only one technique - ju? Naihanchi - why a grappling kata? How should we do "mutual benefit?" Orbit or center of mass? Naihanchi - Which direction does it start?